Right now in Jim’s Coffee House in downtown, Elyria, Ohio an attempt is being made on the world-record for a marathon, non-stop, poetry-reading. 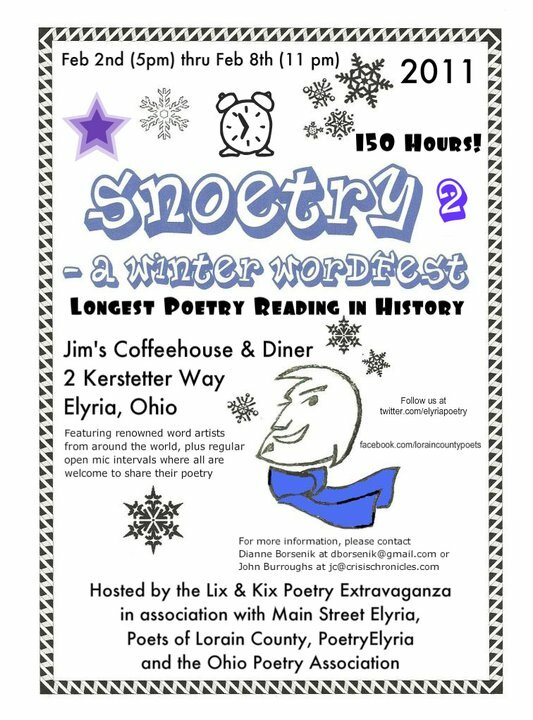 “Snoetry 2: A World Record Winter Wordfest — 150 Hours of Poetry”, organized by Diane Borsenik and her poetry partner John Burroughs (no relation! ), began last Wednesday, and is scheduled to go on through till Tuesday, just before mid-night, in an attempt to break the record of 120 hours, set last April by Kansas City’s redoubtable Prospero’s Books. What pleases us is that Dianne Borsenik’s reading of the complete Howl kicked off the event. Wonder how they’re going to end it? Similarly in New York, on Friday (Feb 11) at Columbia University’s Morningside Campus. there’s, A Celebration of Columbia’s Beats. Join the Columbia Alumni Association, Professor Ann Douglas, composer and musician extraordinaire David Amram, writer Joyce Johnson, and a cast of dozens as Columbia honors its Beat prodigal sons, Allen Ginsberg and Jack Kerouac, in the 6th annual HOWL. The day’s program includes a reading and conversation with Joyce Johnson and readings to David Amram’s music, including selections from On the Road and the complete text of Ginsberg’s “Howl”. Next Tuesday, Feb. 15, at the Peabody Institute Library, Peabody, Massachusetts, in the second of a free series on “Groundbreaking American Poetry”, North Shore Community College, Professor, Carl Carlsen will be publicly lecturing on “Howl.” “It’s a poem that gives you permission, so to speak”, he’s quoted as saying, “(permission) to go wild and put on the page what ordinarily might seem taboo”. We’ve already alerted you to Angelheaded Hipsters: Discovering the Beat Movement, the talk in London on Saturday the 19th (please note that that is at 10.30 in the morning). That same day in San Antonio, Texas (as part of their Howl Festival: Homage to Allen Ginsberg, co-sponsored by the Shambhala Meditation Center of San Antonio and The Twig Bookstore, there will be another Ginsberg-related occasion, Another reading of the complete text of Howl, followed by a marathon (not quite as marathon as Elyria!) open mic reading/ celebration. The Twig Bookstore is at 200 E Grayson Street. Small presses from around the southwest area will be on hand with new books and broadsides.